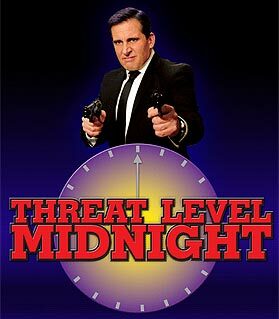 I want to point out that after a tiny bit of googling, I found that “Threat Level Midnight” is an episode of The Office (US version). Blizzard, specifically Ghostcrawler, decided to talk about threat and tanking abilities. In a dramatic departure from previous Dev Watercoolers, they actually mentioned changes that will be coming instead of things they might think about later. I would trade pretty much anything for active damage reduction similar to Death Strike. I think that’s a move in the right direction. Active gameplay is the way of the future, and the sooner we ditch WoW’s old fashioned passive tanking, the better. I don’t necessarily like the heavy resource requirements of Death Strike, but bears only have to deal with rage, so it could never be as complicated. Worst case is that we’ll just have to store rage, which is far easier than the rune and runic power balancing act that Death Knights have to go through. Now on to the specific quotes. It sounds like this will be available immediately, or very quickly. I’ll have to pay attention to my threat tonight to see if I notice a difference. In an upcoming patch: Vengeance no longer ramps up slowly at the beginning of a fight. Instead, the first melee attack taken generates Vengeance equal to one third of the damage dealt by that attack. As Vengeance updates during the fight, it is always set to at least a third of the damage taken in the last two seconds. It still climbs from that point at the previous rate, still decays at the previous rate, and still cannot exceed the current maximum. I’ll have to wait and see how this change to Vengeance will look once it’s on the PTR, but right now it sounds like we get Vengeance faster. If Savage Defense still relies on our attack power, this will be great for increasing those shields early in the fight. We want to move the shorter cooldowns like Shield Block, Holy Shield and Savage Defense so that they work more like Death Strike. Blood DKs have a lot of control over the survivability they get from Death Strike, but as part of that gameplay, they have to actually hit their target. The other three tanks will get similar active defense mechanics. Either they’re referring to an upcoming but as of yet unannounced change to Savage Defense that makes it a clickable ability, or they confused it with Pulverize. Either way, we’re getting active defenses. This is something I’ve dreamed about for a long time. I thought it wouldn’t happen until the next expansion, but it’s actually coming true. I will have control over my survivability. No longer will my life outside of cooldowns be entirely dependent on random dodge or my healers. What a glorious day! Redesigning Savage Defense to make it a rage sink is an even bigger change, but we think there is an opportunity there to make the rotation more interesting for druids (and all tanks really). If they’re talking about Pulverize, then we might be looking at a short cooldown ability that increases crit but costs all three Lacerate stacks and a large amount of rage. Or they might be giving us a whole new ability. Maybe Savage Defense will become active, so that it’s an ability we hit that every 6 seconds or so and absorbs a number based on attack power. However, if Savage Defense is no longer a random proc, they’ll have to find a way to make crit useful to us again. Maybe our on-use Savage Defense could have a chance to crit, similar to a warrior’s critical block. If SD became a clickable ability, it’d have to absorb more damage that it currently does, similar to Death Strike. Or Blizzard could be taking our little bear shields in a whole new direction. It’s hard to say anything before we get more specific information. Overall, screw threat. If that means I get to participate in my tanking, I’m a happy bear.